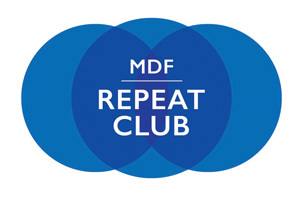 The MDF Repeat Club is our monthly donor program. Joining the MDF Repeat Club is a great way to support MDF’s Care and a Cure programs. Your monthly donation will make a difference throughout the year for individuals and families living with myotonic dystrophy. Setting up a monthly gift is easy, and it creates big impact. $20 a month underwrites the MDF Toolkit for 3 newly diagnosed families, that's 36 toolkits a year! As a member of the MDF Repeat Club, you will receive special recognition at the 2016 MDF Annual Conference in Washington DC, acknowledgement of your commitment via social media, and you'll join the MDF Repeat Club Wall of Fame (if you choose to). Click here to go to the MDF Repeat Club donate page and set up your account. You will receive an email confirming the establishment of your monthly donor account from Network for Good, the company that manages MDF's online donations. You will also receive an email from MDF welcoming you to the MDF Repeat Club. We are deeply grateful for your support. Together, we will continue to advance care and find a cure. To visit the MDF Repeat Club Wall of Fame and see who is already a member, click here. If you have any questions about the MDF Repeat Club, please contact MDF at info@myotonic.org or call the MDF office at 1-86-MYOTONIC. The Network for Good financial transactions website is extremely secure. Click here to read the NFG Security, Privacy, and Disclosure Statement.